About 35,000 runners have been pounding streets in the London Marathon. Elite athletes, six Maasai warriors, a 101-year-old man and amateurs hoping to raise thousands of pounds for charity were among those taking part. Forecasters had predicted perfect conditions for the 28th annual race but pouring rain drenched participants. Defending champion Martin Lel of Kenya won the men's race in a course record of 2 hours 5 minutes; Irina Mikitenko, from Germany took the women's title. In her first ever marathon win, Mikitenko crossed the finishing line in the pouring rain in a time of 2 hours and 24 minutes. Some runners had faced a slight diversion to the route following a suspected gas leak near Canary Wharf. Engineers however found no trace of a leak, and the area was soon given the all clear. 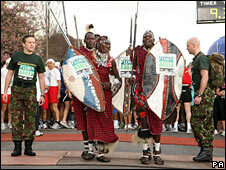 In the procession of runners weaving their way on the 26.2 mile (42.2km) course through the capital from Greenwich and Blackheath in south-east London to Buckingham Palace was Buster Martin. At 101, the smoker, drinker and father of 17 was hoping to become the oldest person to complete the race. Others with dyed hair, in fancy dress or on stilts merely wanted to get to the end in one piece to raise money for charity. Six Maasai warriors certainly came dressed in elaborate costumes of headdresses, shields and jewellery but these were their every-day clothes - only their shoes made from car tyres were a new addition. Isaya, one of the warriors, seemed confident his "comfortable" footwear would not pose a problem over the distance, but was less sure about the weather. "It's very cold. It's very, very cold," he told the BBC. He said he anticipated his group, who aim to raise money for clean water for their home village in Tanzania, would cross the finish line after four hours, slowed down by their plans to sing and dance along the route. The memory of Jane Tomlinson, one of the London Marathon's most well known participants, lived on this year, as her daughter and husband ran together. Mrs Tomlinson, from Yorkshire, died last September, aged 43, after a seven-year battle with cancer during which she performed many feats of endurance and raised millions for charity. This year, her husband Mike, said he and their daughter Rebecca, 20, wanted to carry on the good work Jane had done for her charity, Jane's Appeal. "It's hard to put into words the feelings for Jane. She was just the most astonishing person. She wanted to show people with terminal cancer can still get on and enjoy life," he said. 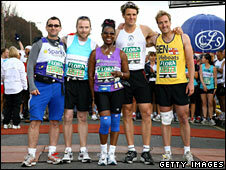 Afterwards, Rebecca said she was relieved to have finished and said she had thought of her mother over the final mile. Dave Heeley, a blind runner from West Bromwich, was aiming to make London his seventh marathon in as many days. As part of the Seven Magnificent Marathons challenge run across seven continents, he has completed marathons in the Falklands, Rio de Janeiro, Los Angeles, Sydney, Dubai and Tunisia so far but jet lag has proved a problem. "The trouble is, your body clock is all over the place and although you are tired and you want to sleep, your body's sort of saying 'hey, you're normally awake at this time, come on, get up', so it's certainly been an experience." 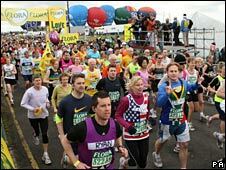 The professional athletes started the race in Blackheath, in south-east London, while the majority left from Greenwich Park. Paula Radcliffe, who has won the race three times and is the world marathon record-holder, was forced to withdraw because of a toe injury. Celebrity runners include chefs Gordon Ramsay and Michel Roux; Liberal Democrat London mayoral hopeful Brian Paddick, and Big Brother 2002 winner Kate Lawler, who was running for the Cystic Fibrosis Trust wearing underwear designed by Ann Summers. Mr Ramsay, who completed the distance in three hours and 45 minutes, said: "As I was coming over Tower Bridge, someone shouted, 'run, fat boy, run' - I don't know if they were talking to me." Former premier league referee Graham Poll, armed with his yellow cards, crossed the line after four hours and 20 minutes. He said the atmosphere had been sensational but admitted being jeered from the sidelines.